Released in April 2019, the Oticon Opn S family of hearing aids has improved upon the outstanding success of the Oticon Opn hearing aids. Oticon Opn has without doubt been Focus Hearing’s most requested and popular hearing aid. Now, with the release of the latest Opn S hearing aids this trend is set to continue. 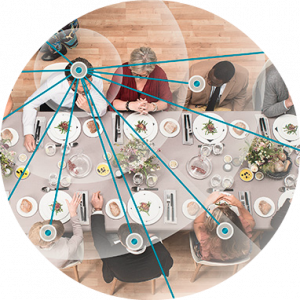 Opn S hearing aids are available in three technology levels to suit your lifestyle and budget: Opn S1 (Premium), Opn S2 (Advanced) and Opn S3 (Essential). BTE PP (high power for severe hearing losses). 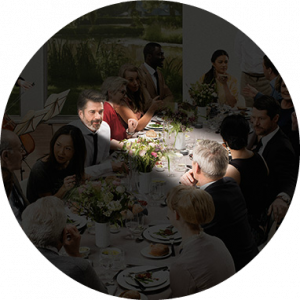 Oticon Opn S features an upgraded version of the OpenSound Navigator that was first released in the Opn hearing aid family. Previous hearing aids would attempt to help people hear in background noise with directional microphone technology, where the hearing aids would focus predominantly on the speaker directly in front of the person. Which meant that the person often missed important information from those who were seated beside or around them. However, with Oticon Opn S and its groundbreaking new ‘Velux S™’ platform, new detectors monitor changes in the acoustic environment with 56,000 measurements per second, which allows it to follow rapidly changing conversations with multiple speakers in in noisy sound environments. The new Opn S technology gives access to all speakers and lets you decide what you want to focus on. 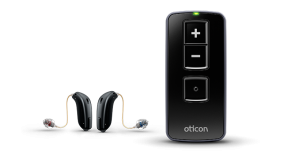 The Oticon Opn S is now available as a fully rechargeable hearing aid system using reliable and stable Lithium-Ion technology. This option adds a level of simplicity to the hearing experience as you never have to worry about changing hearing aid batteries again. Simply charge the Opn S each night when you remove the hearing aids for bed, and wake to a full charge to enable a whole days use. In fact, the system is fully charged after only 3 hours, and if you forget to charge overnight a quick 30 minute charge will allow 6 hours of use. Oticon Opn S wirelessly connects directly to your iPhone without the need for an additional neck worn accessory. The hearing aids double as a wireless headset which allows you to enjoy perfectly clear audio (from phone calls, music or video) streamed directly to the hearing aids. With the Oticon ConnectClip accessory, you can stream high quality sound to both hearing aids from either Android or iPhone, including phone calls, music and video audio, using 2.4GHz Bluetooth low energy technology. This allows for stereo streaming to both ears, free from unwanted noise and low battery consumption. 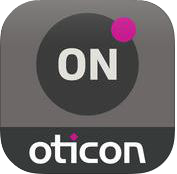 The new Oticon ON App allows you to seamlessly and discreetly control your hearing aids. You can adjust volume, change listening programs, access user instructions, check battery status or even use the ‘find my hearing aid’ feature if you happen to misplace your hearing aids. Wirelessly stream the TV dialogue directly to your Oticon Opn hearing aids without the need for a neck worn Bluetooth accessory. Set the volume to your preference for crystal clear audio. Anyone else in the room hears the TV normally. If you do not have an iPhone to use the Oticon ON app, you can still discreetly regulate the colume, change programs or simply turn off your hearing aids with the very handy remote control from Oticon.